The BladderScan BVI 3000 bladder volume instrument, with VMODE® technology, is a portable 3D ultrasound device that quickly, accurately, and noninvasively measures urinary bladder volume and post-void residual (PVR) in adults. The BVI 3000 calculates bladder volume using patented VMODE® technology. Volume measurements made with VMODE ultrasound are more accurate than those from conventional 2-dimensional ultrasound, as they are based on a more complex, 3-dimensional image of the bladder. VMODE ultrasound is easy to use and comfortable for the patient. When you press the scan button, within seconds, the VMODE technology measures ultrasonic reflections on multiple planes inside the body and produces a 3-dimensional image. Based on this image, the instrument calculates and displays the bladder volume, and displays multiple B-mode images. 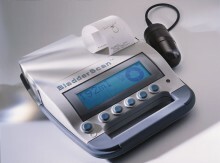 Click the button below to add the Verathon BladderScan BVI 3000 Bladder Scanner to your wish list.